The Polka Theatre, in Wimbledon, has announced its new autumn/winter season which will comprise both new Polka productions and visiting work, as well as classes and workshops for Primary pupils. 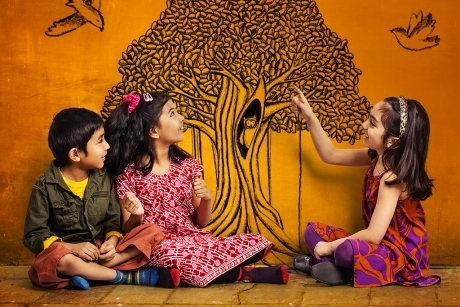 On the Main Stage, the season opens with Three Sat Under the Banyan Tree, the first stage adaptation of the Panchatantra tales in the UK. This new production runs from 28th September to 21st October. Across the festive season, Polka will stage The Wind in the Willows by Kenneth Grahame. This adaptation by Toby Hulse, is brought to life with music and songs by director Roman Stefanski and will run from 9th November to 17th February 2019. For younger pupils, the Adventure Theatre will be transformed into a cosy story telling hut where master storyteller Jan Blake will tell the tale of In the Winter Wood. This new show will be running from 29th November to 17th February. Under the Rainbow will be performed from 24th October until 3rd November and is suitable for Key Stage 1. It will use puppetry and a transformative set to tell the story of one woman’s courageous journey. Other productions will include The Gingerbread Man and Snow White, Rose Red, Brown Bear. All productions are suitable for Primary pupils, with some better suited to Key Stage 1 groups. School workshops also can be arranged, and these include tailor-made sessions, Black History Month, show-related workshops, page to stage, and puppetry workshops. Teacher resources are also available online and can be used to aid a visit and take what the children learn back into the classroom. For more information, visit www.polkatheatre.com.